The Anker Soundcore speakers are some of the best in Bluetooth sound today as well as some of the most reasonable speakers you can pick up. Anker has long been a brand that is synonymous with both quality and value and their Soundcore line of speakers are a perfectly serviceable choice for anyone that’s interested in a high quality Bluetooth option for their speakers. The speaker is stylized with a beautiful construction and it comes in three colors including black, blue, and red. With a 24-hour battery life the item can provide you with an extensive amount of great sound with the need to charge only once a day. Reliable battery life ensures that you can continue using the speaker over a long period of time. The speaker is very simple to use. It has large, easily identifiable buttons that control the majority of the basic functions (play / pause, call management, volume …). If you can move to the next song by pressing the play button twice, you can not go back to the previous song. In addition, the volume is not always linked between the player and the speaker when using Android. It is however the case on iOS. Two light indications as well as voice aids are there to guide the user during the handling and pairing of the speaker, which is always appreciable. Bluetooth pairing is seamless, even if it is not possible to pair two devices at once. What we end up with is a stylish and extremely reliable speaker that’s available at a price point that is far less than what you might expect of a typical Bluetooth offering. It’s super portable and it’s crafted to create some wonderful audio no matter what setting it is used in. The main features of this incredible Bluetooth speaker are its zero distortion sound design, the easy connectivity with up to 66 feet of reach, simple controls, extensive durability and excellent battery life. Anker has made this Bluetooth speaker quite rich with a number of features it has to offer. Instead of offering just a simple plug-and-play speaker or wireless speaker, this is a Bluetooth solution that can provide users with ongoing and reliable quality of sound. With its three color design there is also some degree of choice when it comes to users getting a look that they will enjoy. The unibody design has curved edges and controls that accentuate from the form of the body. It is like a smooth pebble that has raised controls ready to complement the style of any home. The beautiful finish that’s available on these Bluetooth speakers will also have you never wanting to customize them. Smooth finishes and easy to use controls make this a Bluetooth speaker that doesn’t need any type of customization or case. The sound quality is especially impressive on this Bluetooth speaker. Within extremely deep bass tone as well as an amazing clarity of sound from to high sensitivity drivers, this is almost like having a high-quality car stereo that you can take with you at any time. The bass port is completely adjustable and the design of these speakers is created to make sure that the best level of sound can be achieved no matter what the setting may be. The digital signal processor is extremely advanced and this means capturing all of the best tones out of the files that this device is playing. Whether you have a song was extremely deep bass notes or high harmonies, the design of this speaker can help to enhance sound quality and make sure that the deepest of highs and lows can be reached. Nevertheless, you should not push the volume too far if you want to keep the quality of the sound. The distortion is indeed particularly present in the bass and treble when you push a little too much, especially on the rich pieces. It is typically the speaker that we can choose to listen to music from time to time when working in the kitchen, or to add a small sound atmosphere in the evening. For more demanding situations, other models a little larger and especially the distortion better contained will be more suitable. Anker has included one of the best batteries on the market for the size of this Bluetooth speaker. With a high-efficiency lithium-ion battery on board Anker has ensured that charging time can be done very quickly and that the battery will last as long as possible. This device can take tens of thousands of charges and still continue to have great battery life. With 24 hours of full listing capabilities available on the Anker Soundcore, you can enjoy never having your music interrupted. Other leading Bluetooth speakers can’t boast the same sound quality or the same quality of battery power either. However, in normal use, the duration is rather around 15 to 16 hours, which is still very nice. The process of setting up this device is incredibly simple. It’s easy to use with phones, tablets or any other device that has Bluetooth enabled. The Anker Soundcore also has some onboard presets that will ensure it can easily connect the last device that was used for an instant music playback if required. What this means is once you have synced up to the Bluetooth speaker, if you were the last device that was connected to the speaker, you can have the option of playing music as soon as you turn on your Bluetooth once again. The quick connect option right back to the same previous device ensures that you can get the best instant music playback as soon as you enter into your home or when you want to play a great song while you are out. 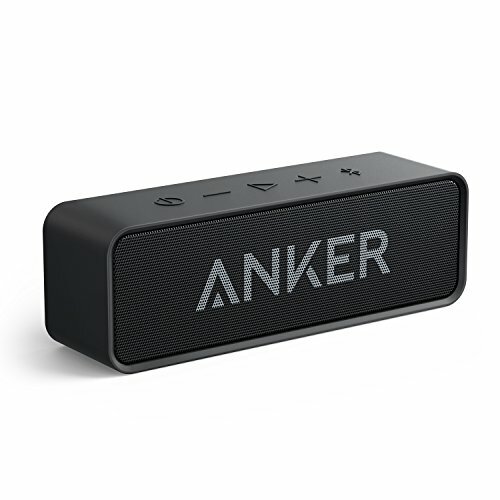 The Bluetooth 4.0 connection makes the process of syncing up with the Anker Soundcore an extremely intuitive solution. The connection power is excellent and you can easily form a stable connection up to 66 feet away making sure that you can easily skip a song or control the action. Having the option to control the device from this far makes sure you can enjoy a better connection speed with almost 0 distortion from the speaker. The Soundcore can also easily connect with devices that use Alexa. With the built-in Alexa microphone you can use Alexa and amplify the sound using Anker. When paired with an Alexa device you can access your Amazon playlists, play music off streaming services and more. Connecting up the Anker Soundcore with the latest Alexa devices can truly turn it into an amplified music or podcast machine for your home. Finally you can have the in-home audio entertainment system that you have always wanted with the option to use it in multiple rooms! The design and durability of the device is one of the best available currently. With a strong unibody core and a strengthened speaker for the front, the overall durability of the Anker device is perfect for use in a variety of environments. The design is touted as drop proof and it’s extremely lightweight for a decent portability throughout any type of environment. You can carry the Anker Soundcore with confidence no matter where you are. Anker stands behind its products and they have backed this product with an 18 month warranty that is also delivered with easy to reach tech support officials. Through this 18 month warranty and the easiest to reach support network it is possible to ensure that the device is covered from a variety of potential issues. Overall, The Anker Soundcore is a fantastic Bluetooth speaker with only a few small drawbacks. At its price point it presents an incredible battery life and an outstanding sound quality. For such a portable device the sleek design and improved Bluetooth capabilities also provide an extensive value. It’s rare to get a warrantee out of any type of Bluetooth speaker but 18 months from Anker also protects your investment in this speaker. If you are looking for an extremely portable Bluetooth speaker device that is also capable of connecting with Alexa products, this is one of the most reasonable and if active on the market right now.